Sherrie Cronin, y1, Cinnabar Press, 2012. Pp. 338. ISBN 978-0-9851561-1-4. $9.99. 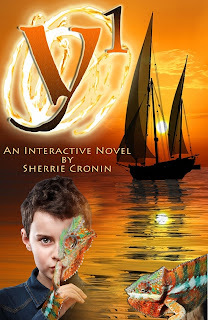 y1, the second of a projected six-part series of novels by geophysicist and seismologist Sherrie Cronin, is a complex and deceptive book to describe. On the surface, it is about the struggle of people who are physically, sexually and emotionally different to find a place and be accepted in that place. Also a murder mystery, several love stories, as well a kidnapping and an exposé of the pharmaceutical industry unfold during the course of the novel. This complex plot, which seems too much for a single volume, is nonetheless interesting and readable, spoiled only by infodumps of propagandist social and economic theory, and poor portrayal of women. Right at the beginning we meet Zane Zeitman, who ‘just doesn’t fit’. Asked what he wants to be when he grows up, he annoys his father by answering, “I want to be a chameleon.” As the book progresses we learn that he does indeed have a chameleon-like ability to change his appearance, almost at will. At college he majors in neuroscience in order to better understand his peculiar condition. Then, unwilling to face the grind of getting a PhD, he takes a job at Penthes Pharmaceuticals, where he comes to the attention of the aging founder and chairman, Dr. Peter Hulson Sr., still mourning the disappearance of his son Peter Jr., and the marketing director, Brenda, who had been Peter Jr.’s lover at the time of his disappearance. Dr Hulson is also obsessed with trying to find a replacement for his missing son. He is also dying of cancer. The struggle to sort out the complex issues surrounding the ethical—or not—marketing of pharmaceuticals by Penthes forms one of the major themes of the book. Still another strand takes us to the South Pacific, to the islands of Micronesia, especially Kiribati, Samoa, American Samoa and Fiji. Here we meet Afi, on the run from a sinister school for troubled teenage boys on a remote part of Samoa, who turns to mystery-man, Toby, restocking his boat in Apia Harbour. Desperately afraid of the men who are stalking him, he persuades Toby to take him on as crew. When the Samoan thugs insist on searching Toby’s boat, The Misadventure, incredibly, the boy has disappeared. After the men depart, Toby is astonished to see Afi unfold himself from a tiny storage cupboard. Afi informs him that he has a condition known as hypermobility, also confessing that the reason he was sent to the school was that he had come out as homosexual. On his conservative Christian island this was a major transgression. Still another theme concerns, Joy Cabrini, who had joined the Peace Corp to escape the marriage plans of her powerful and over-controlling father. Informed that he is on the way to Samoa to bring her home, Joy also seeks shelter with Toby on his boat. So many powerful and important themes—almost too many for a single book, mostly come together to make an interesting and more or less believable read. For people who like complicated plots with a multitude of characters, this book should be like Christmas and birthday rolled into one. I do have to say, I am not really impressed by the depiction of women here. Of the two main female characters, one is shown to be foolish and unstable (where have we seen those words before?) and the other a child-like creature who runs from one daddy figure to another. Interesting as this multifarious plotting it may be, unfortunately, it all requires vast quantities of supporting information, which Ms Cronin provides by inserting numerous, long and detailed infodumps. Some, like facts about the islands and communities of Micronesia are, at least interesting, and are relevant to moving the plot line forward. Many, many others consist of entire pages-long tracts of political and philosophical propaganda, ostensibly lifted from the Y1 web site, that greatly diminish what was an otherwise interesting read. This Y1 site is apparently live and links to it and many other items are available in a kind of bibliography at the end, a deviation from form that is not usually found in a work of fiction. To be fair, I concede that the author truly believes in the social message, a mash-up of Ayn Rand concepts of personal, financial and social self-sufficiency and out of the goodness of her heart wants to ‘share’ this important message with us, her would-be readers. But if I wanted to be improved, I could call on the services of any number of self-help gurus or their publications which at least state their intentions honestly. I read at home, usually at the end of the day, for pleasure, to relax after my labours. I suspect most people who read genre fiction do much the same. If I had paid real money for this book and run into this propaganda barrage, I would have been bloody irritated. Another glitch comes right at the end, when we get a series of short chapters, summarising the events of the years between 2010 and 2064, a kind of leap-frogging to the future and deaths of the main and several minor characters. As well as feeling gratuitous and incomplete, these sections should be the substance of different books and as such are completely irrelevant to this book. In short, y1 is certainly an interesting read, but spoiled by structural issues, and too much propaganda.